With a few basic tools and a weekend, anyone can build a beautiful project out of wood for their outdoor space!Hand-Built Outdoor Furniture covers the basics of woodworking--how to measure, where and how to shop, and how to screw, sand, and paint. The twenty step-by-step projects are fully illustrated with hundreds of clear and easy-to-follow photographs, and the required materials and tools can be found at local hardware and lumber stores. Finished pieces include simple items include a trellis, a flower box, and a plant stand and more complicated projects include a chaise lounge, a sectional with built-in storage, and a slat bench. Katie Jacksons projects are simple, clean, and timeless and work well within a wide variety of styles. 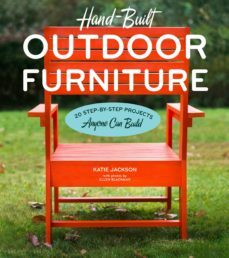 Hand-Built Outdoor Furniture is the perfect primer for people new to woodworking, DIYers, and homeowners looking for a simple and affordable to decorate their space.